Also known as my computer room. Thought I'd share with everyone my area, the room where I go to be creative. It's a mess, I'm not gonna lie about it. I try to clean it and it will stay that way for a day or so but it eventually ends up with piles everywhere, so I just try to do the best I can in my mess. I have two desks side by side, one is for my printer and computer - you'll notice I have another printer underneath, some day I'll put that on the desk and get rid of the older one. The other desk has my scanner, and my quilling projects in progress, scrapbook paper and my Cricut. I'm trying to keep track of projects this year by using my wipe erase/corkboard to the left of everything, so far so good. I have a 3 drawer plastic shelf for paints, books and painting supplies. 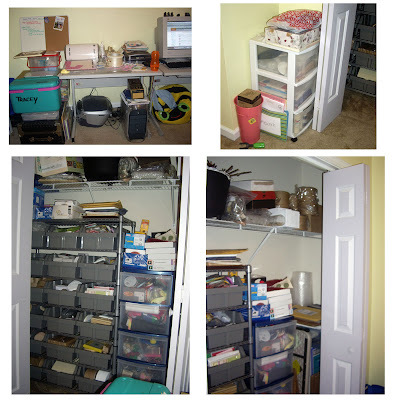 Now, inside the closet is insane, I have so many items to add quilling too and not enough time. I have paper mache, wood, paper - just everywhere. I purchased this lovely heavy duty shelf unit a couple years back from Sam's Club and I love it. Next to that I have a tall 5 drawer shelf which has ribbon, felt, pom pom's and a drawer for my son's crafty items. On the top shelf of the closet I have more paper mache and wood items, I also have polyfil and fleece in there too, left over from the days of sewing. My coworker knows to ask me if I have something before going out and buying it, most likely I have it if it involves crafts. Makes me laugh to look at all my stuff, and I'm sure one day I'll actually get to creating with half the stuff I have. Hi- I am the same way with supplies. It seems like every time I start a new project I go out and buy way too many supplies! One of my goals this year is to try and actually use the stuff I have piling up in my studio instead of buying more, but we'll see! I love your work!! yes, lately piles are my friends! hahaha!! Great space you have though! At least you have a room - I'm confined to a self-standing storage cabinet and the kitchen table. I have to clean up my quilling after I'm done with each session so we can eat together. Some day I'll have my own hobby room....Ah! To dream! When I first suggested to my husband I was going to open an online shop his comment was..
"Well at least you have enough inventory already to stock the entire store"
The rush when I open a new shipment of paper... I even love the smell!!! I like using this type of table so I can take it down when I have a class. I guess there are worst things in life to be addicted to!! !